Not only do I have a great giveaway for you, but I'm also excited to introduce you to a new online destination for hand-crafted jewelry, scarves, and more! Iristy is a new start-up based out of Boston Massachusetts inspired from the pure enjoyment of arts and crafts. They design and hand-craft jewelry, with the main focus being beaded-based styles. Along with our exclusive and unique handcrafted items, they also sell items they find and love, often mixing and matching handmade styles with other popular jewelry for an even more unique result. The nice people over at Iristy sent me this black and white crystal wrap bracelet that I am completely in love with! The combination of the hemp and crystals give it a unique look that can be dressed up or down. I wore it over a cozy sweater and got many compliments on it. To enter simply follow the instructions below, but first you can save 25% off anything on the site with the promo code "BABBLINGS25". Enjoy! I like the assorted green hemp wrap bracelet. Wow, they have a couple of things I really like. But the White and Vintage Gold Chandelier Earrings stands out! These are super cute! Great giveaway! I love the Black Pearl Tear Drop Pendant. So pretty! 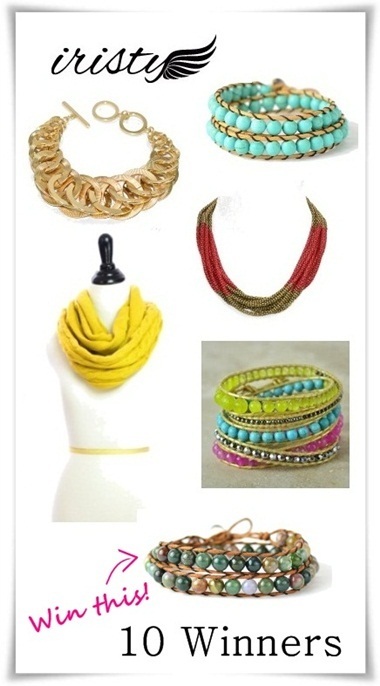 I love the teal/turquoise looking bracelet! Beautiful! My favorite is the Black Pearl Tear Drop Pendant! All so beautiful! I really like the black and white pearl bracelet. I love their Black and Vintage Gold Chandelier Earrings or their Wavy Silver Bangle with Czech Crystals! I think my fave is the Leather Love Charm bracelet! The Silver Swirl Earrings with Turquoise Ball are super cute! I like CZ Heart Silver Bracelet. My favorite item is the navy cable infinity scarf! 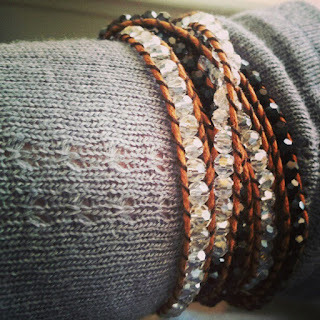 The black and white crystal wrap bracelet is my favorite! I am never leaving this blog! My favorite item is the pair of White and Vintage Gold Chandelier Earrings. Great giveaway! My favorite item is the Aquamarine Hemp Wrap Bracelet. I really love th Rhinestone Elephant with Stones necklace. Love the Multi Color Hinged Bangle! I really like the black and white crystal wrap bracelet!! I love the multi color hinged bangle! So cute!! And my email is Aimeenoellewebber@gmail.com ! i like that green bracelet!